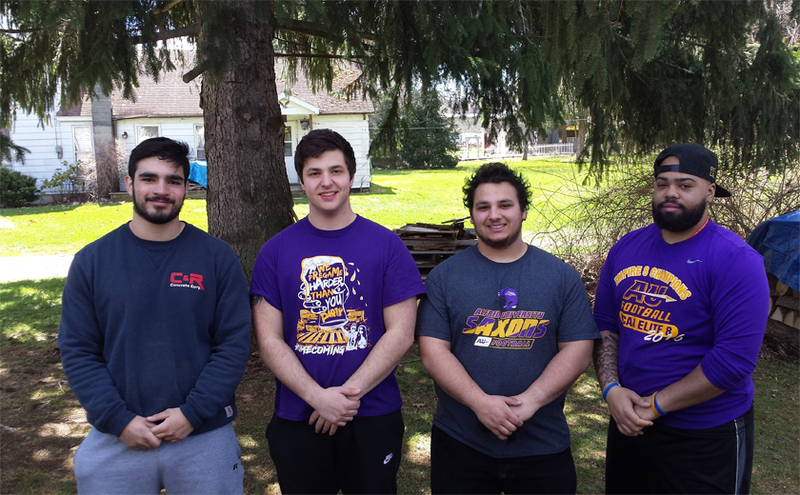 Four members of the Alfred University Football Team scored big with residents in the Alfred-Almond Community Saturday, April, 8th and they "cleaned up" in this off-season community service event. Team members helped the Williams' by reclaiming some area that used to be the family garden and raking the yard. "I didn't get out as much with this year's crew, but the laughed at most all of my jokes so their welcome to join us any time. We cannot say enough to thank these young men," said Dave adding, "Their cheerfulness and eagerness to help us was truly a blessing and we were humbled and grateful for their assistance." Dave is still being treated for injuries sustained to his knees and hips in January of 2007 while serving as a volunteer firefighter. In 2010 Dave suffered a heart attack, the very next year Cathy had surgery on her back. His wife Cathy commented, "This was such a huge blessing to both of us. They may not understand the full impact of their kindness but in a very short amount of time these young men finished what would have taken Dave & me a full week to complete." Cathy went on to say that someone told her that, "Volunteers aren't given any more hours in the day than the rest of us, they just choose to use the time they are given with a spirit of grateful giving." Dave & Cathy went on to say, "Sometimes you hear about that smaller segment of college students who have made mistakes in our community which can have a negative impact on the community's perception of the student population in general. Yet the countless hours of volunteer work these students give back to this community over the few short years they live with us seems to go unnoticed. It is very important to us that we give credit where credit is due and praise these fine young men and women who give of their time so selflessly." The Williams' commented that these young men had great senses of humor and a great work ethic. The Williams' wish nothing but the very best for these fine young men in the future and will not soon forget their generosity and cheerfulness.